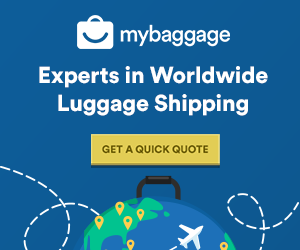 My Baggage offers low cost, quick and convenient luggage delivery to 200+ countries worldwide. So, no matter where you’re going, we can give you a helping hand with your luggage to make your journey as stress free as possible. You can book your luggage delivery online any time with My Baggage. Simply visit our homepage and get a quote to see exactly how much your luggage delivery will cost. It takes just a few moments to fill in your details and complete your booking. After that, we’ll do the rest! We’ll collect your luggage from your front door and we’ll deliver it quickly and safely to where it needs to go. It sounds simple and it is! My Baggage is a great low cost alternative to airline baggage. With prices starting at just £16.99, our luggage delivery costs are up to half the price of many major airlines. We also offer a Price Match tool, so if you do happen to find a cheaper price elsewhere, let us know and we’ll try to beat it. And with My Baggage, you get value for money too. We provide a generous 30kg weight allowance per item and we offer £100 free compensation cover, which you can increase during booking for a small additional fee if you wish. Using a luggage delivery service, is often the most convenient option when you have baggage, suitcases or boxes to ship. By offering a door to door collection and delivery service, you can travel hands-free. This is especially beneficial to students or expats, those taking long holidays or doing a bit of travelling. By booking your luggage delivery with My Baggage, you won’t have to worry about checking in bags at the airport, queuing at baggage carousels or forking out for excess baggage fees. We also provide full online tracking, so you can monitor the progress of your luggage delivery every step of the way. This means no need to worry about luggage getting lost in transit – one of the main pitfalls of the airline baggage industry. Easy online booking and secure payment, 24/7. International luggage delivery to 200+ countries. Full online tracking, as well as email and text notifications. My Baggage provides luggage delivery within the UK, to Europe and to 200+ countries worldwide. Our international luggage delivery rates are extremely low and you can get a quote any time. The price you see is the price you pay – no hidden charges or fees!